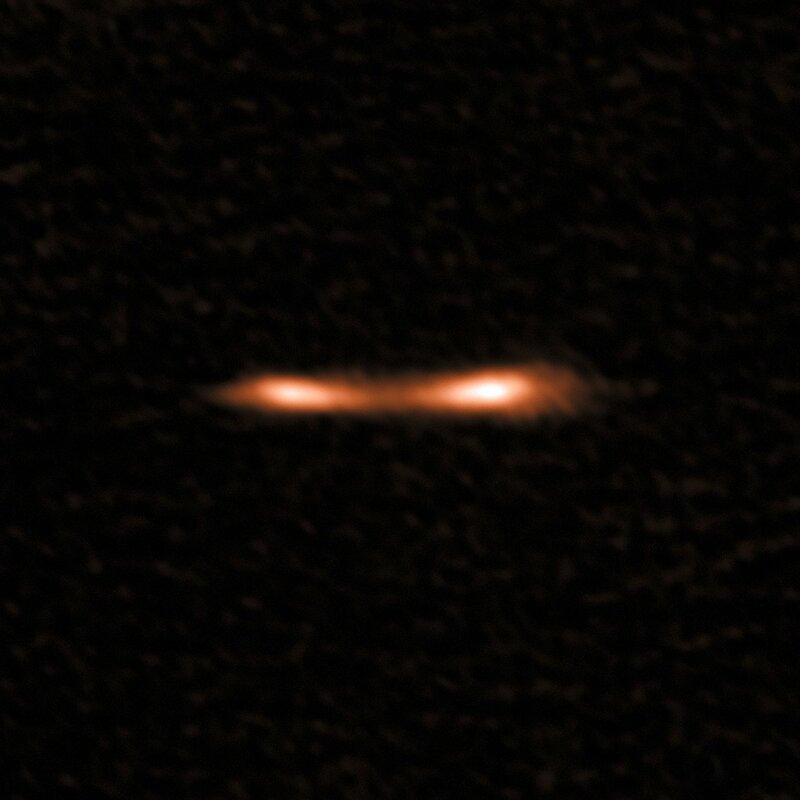 ALMA has been used to detect turbulent reservoirs of cold gas surrounding distant starburst galaxies. By detecting CH+ for the first time in the distant Universe this research opens up a new window of exploration into a critical epoch of star formation. The presence of this molecule sheds new light on how galaxies manage to extend their period of rapid star formation. The results appear in the journal Nature. A team led by Edith Falgarone (Ecole Normale Supérieure and Observatoire de Paris, France) has used the Atacama Large Millimeter/submillimeter Array (ALMA) to detect signatures of the carbon hydride molecule CH+  in distant starburst galaxies . The group identified strong signals of CH+ in five out of the six galaxies studied, including the Cosmic Eyelash (eso1012) . This research provides new information that helps astronomers understand the growth of galaxies and how a galaxy’s surroundings fuel star formation. “CH+ is a special molecule. It needs a lot of energy to form and is very reactive, which means its lifetime is very short and it can’t be transported far. CH+ therefore traces how energy flows in the galaxies and their surroundings,” said Martin Zwaan, an astronomer at ESO, who contributed to the paper. How CH+ traces energy can be thought of by analogy to being on a boat in a tropical ocean on a dark, moonless night. When the conditions are right, fluorescent plankton can light up around the boat as it sails. The turbulence caused by the boat sliding through the water excites the plankton to emit light, which reveals the existence of the the turbulent regions in the underlying dark water. Since CH+ forms exclusively in small areas where turbulent motions of gas dissipates, its detection in essence traces energy on a galactic scale. The observed CH+ reveals dense shock waves, powered by hot, fast galactic winds originating inside the galaxies’ star forming regions. 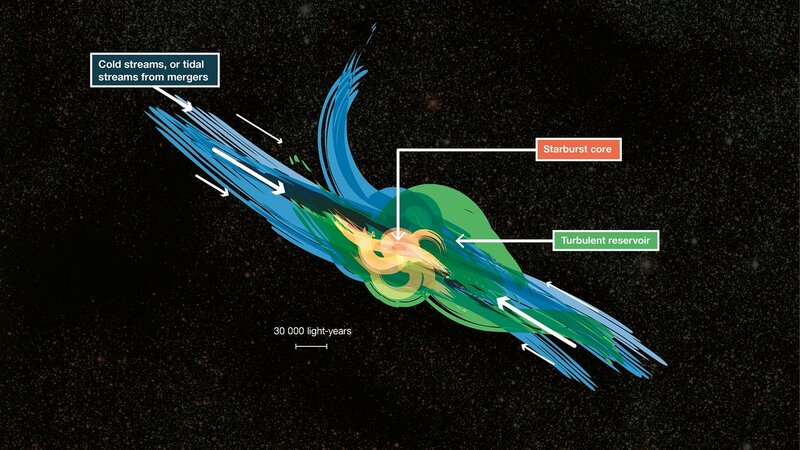 These winds flow through a galaxy, and push material out of it, but their turbulent motions are such that part of the material can be re-captured by the gravitational pull of the galaxy itself. This material gathers into huge turbulent reservoirs of cool, low-density gas, extending more than 30 000 light-years from the galaxy’s star forming region . The team determined that galactic winds alone could not replenish the newly revealed gaseous reservoirs and suggests that the mass is provided by galactic mergers or accretion from hidden streams of gas, as predicted by current theory. CH+ is an ion of the CH molecule known as methylidynium to chemists. It is one of the first three molecules ever discovered in the interstellar medium. Since its discovery in the early 1940s, the presence of CH+ in interstellar space has been a mystery because it is extremely reactive and hence disappears more quickly than other molecules. These galaxies are known for a much higher rate of star formation compared to sedate Milky Way-like galaxies, making these structures ideal to study galaxy growth and the interplay between gas, dust, stars, and the black holes at the centres of galaxies. ALMA was used to obtain spectra of each galaxy. A spectrum is a record of light, typically of an astronomical object, split into its different colours (or wavelengths), in much the same way that rain droplets disperse light to form a rainbow. Since every element has a unique “fingerprint” in a spectrum, spectra can be used to determine the chemical composition of observed objects. These turbulent reservoirs of diffuse gas may be of the same nature as the giant glowing haloes seen around distant quasars. This research was presented in a paper entitled “Large turbulent reservoirs of cold molecular gas around high redshift starburst galaxies” by E. Falgarone et al., to appear in Nature on 30 August 2017. The team is composed of E. Falgarone (Ecole Normale Supérieure and Observatoire de Paris, France), M.A. Zwaan (ESO, Germany), B. Godard (Ecole Normale Supérieure and Observatoire de Paris, France), E. Bergin (University of Michigan, USA), R.J. Ivison (ESO, Germany; University of Edinburgh, UK), P. M. Andreani (ESO, Germany), F. Bournaud (CEA/AIM, France), R. S. Bussmann (Cornell University, USA), D. Elbaz (CEA/AIM, France), A. Omont (IAP, CNRS, Sorbonne Universités, France), I. Oteo (University of Edinburgh, UK; ESO, Germany) and F. Walter (Max-Planck-Institut für Astronomie, Germany).